So, I pulled all my friends out of my stable and got a group photo. Let me tell you a little about them. Back just before? Wrath hit, a few friends and I hopped into MC and grabbed me a Core Hound. We were all fresh new Jenkins's. I haven't fully leveled him up yet, but she'll be my PvP pet once I do. Other than her wonderful caster speed debuff, she has the added bonus of tingling old MC memories of seeing an enraged massive core hound coming at you. She was my first exotic. 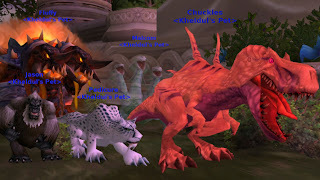 Chuckles is my fun dps pet. Chuck can rip stuff up quite nicely. Sadly he does a little less damage than cats and scorpids. He also has a pretty bogus hitbox flaw. He starts off with a rather large hitbox. The hitbox grows when he gets his specials off, and of course when he is en-wrath-ed. This makes some encounters pretty much impossible to keep him alive. He's bigger than the holes in the flame waves of Sartharion. He's eatting almost every Heigan the Unclean spew. My cat doesn't have these problems. Malcom, the one in the middle (gaaah), is just the gimmicky ghostly three-headed hydra. Also known as crocolisk tank pet. Pedicure is my raiding pet. He does pretty excellent dps. Yes, scorpids can buff-stack-poison better and higher, but that's getting nerfed to oblivion in 3.0.8. Cats are getting hit, but not too horribly and will remain a top choice for all talent trees. Having Pedz will allow me to try out other talents when the axe falls on BM.